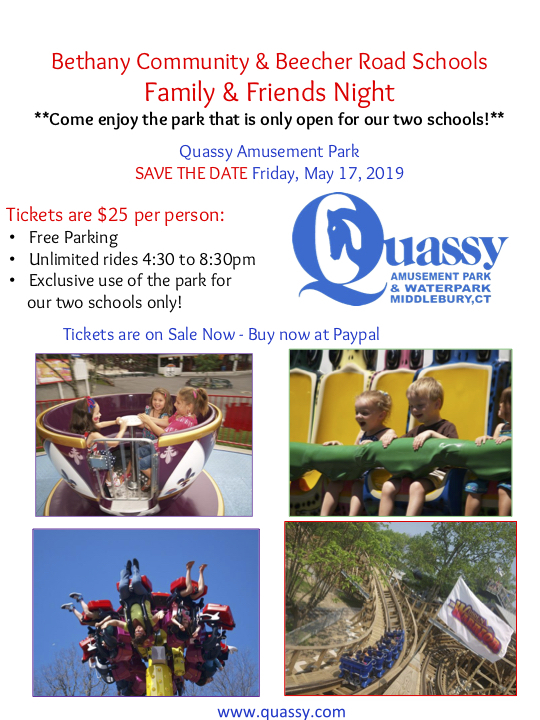 Quassy Park - Save the Date and Purchase your tickets today! Bethany Community School & Beecher Road Schools Collaborating on a wonderful family event this Spring at Quassy park. Our school will benefit from all ticket sales as well as any concession foods purchased inside the park. Your tickets include access to the park and free parking. Please see the attached flier for more details. Contact MaryGrace Crisci or Trudianne Formica with any questions. Tickets are on sale now and can only be purchased online with the links below.